Top regional leaders of 20 faith groups pledged to continue advocating for religious freedom in Brazil during a weekend festival sponsored by the now 120-year-old International Religious Liberty Association. 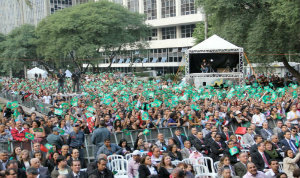 Nearly 30,000 attendees of the World Festival of Religious Freedom packed Anhangabaú Valley in São Paulo, Brazil, on May 25. The event drew representatives of 20 faith groups to promote freedom of conscience. A celebration of freedom of conscience, which highlighted the largely peaceful coexistance of faith groups in Brazil, drew nearly 30,000 attendees to the second World Festival of Religious Freedom on Saturday, May 25, in Anhangabaú Valley, an open plaza area in central São Paulo. The festival spurred City Hall to declare May 25 as an annual “Religious Freedom Day,” and the weekend celebration was reported by the O Globo news agency. The IRLA holds several regional festivals each year as an opportunity to thank countries and their governments for allowing religious freedom. IRLA’s first world festival was held in Peru in 2009. In days preceding the downtown gathering, IRLA also sponsored symposiums with faith leaders and local government representatives. Religious freedom proponents at a pre-festival symposium. 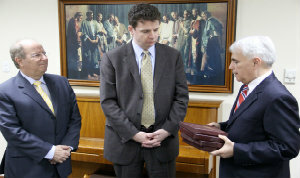 From left, Edson Rosa, secretary general of the IRLA in South America; Todd McFarland, legal adviser to IRLA; and Claudio Costa, president of The Church of Jesus Christ of Latter-day Saints in Brazil. On May 22, a group met for an International Symposium on Law and Religious Freedom at the Bar Association of Brazil. Bar president Marcos Costa addressed the group saying, “We will continue to support this committee because we believe it is a matter of respect and love for others,” he said. In a separate interview, Damaris Kuo, who chairs the bar’s Commission on Religious Freedom, said even among the mostly peaceful coexistence of faith groups in Brazil, there are still situations every day where legal intervention is necessary to prevent a violation of rights. Brian Grim, senior researcher at the Pew Research Center’s Forum on Religion and Public Life, offered an overview of freedom of conscience. He said 40 percent of the world’s countries have major restrictions on religious freedom rights. Additionally, one-third of countries have rules that force people to profess some sort of religion, prohibiting athiesm. In 31 percent of countries, Grim said, reigious intolerance can often result in arrests. On May 23, a hall of the Legislative Assembly of the State of São Paulo hosted the International Forum for Religious Freedom. The meeting included freedom of conscience activists, lawyers and representatives from various religions, including the Church of Jesus Christ of Latter-day Saints, the Catholic Church, Assemblies of God, Baptists and the Seventh-day Adventist Church. Today, roughly 65 percent of Brazil’s population identifies themselves as Catholic, 22 percent are Protestant, and 15 percent say they have no religious faith, according to the Brazilian Institute of Geography and Statistics. The population of evangelicals has grown in recent years in the largely Christian nation. 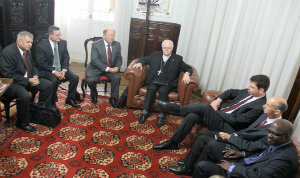 IRLA representatives meet with Odilo Scherer, center, archbishop of the Catholic Church in São Paulo. Glauber Alencar, leader of the Council of Ministers of the State of São Paulo, said religious tolerance is important and continues to be a cornerstone of the council. At the main festival ceremony on Saturday, government representatives included Gilberto Carvalho, who serves as chief minister of the secretariat of the president Dilma Rousseff. Another was São Paulo Councilman Paulo Frange, who authored legislation to mark May 25 as Religious Freedom Day in City Hall. Another attending legislator was state Representative Campos Machado, who has previously authored legislation highlighting religious freedom. Representatives of various faith groups also addressed the crowd. Odilo Scherer, archbishop of the Catholic Church in São Paulo, praised actions promoting religious freedom, saying that Brazil is a peaceful place because there are no laws forbidding a choice of faith and no persecution. Still, Scherer said there was a need for awareness to not exclude participation of religious people in society. “If you do that, it’s going to be a problem and an obstacle for religious freedom, especially when citizens who profess any religion have less opportunity and suffer discrimination,” he said. Sheikh Jihad Hammadeh, chairman of the National Union of Islamic Entities, said the event was needed as “a way to reaffirm the commitment to a pluralistic society of mutual respect.” He also said he was content with Brazilian legislation that ensures a fundamental right of belief, but there is still work to do in educating people to tolerate beliefs different than their own. There are about 1,350,000 Muslims in Brazil. Claudio Costa, president of the Church of Jesus Christ of Latter-day Saints in Brazil, said the country is a model of peaceful co-existence of different religions. “Brazil can show other countries that it is good, healthy and right,” he said.